The meniscus is “divided” into 3 zones. The outer 2 zones can usually be repaired secondary to their blood supply. Nearly 1,000,000 meniscus surgeries are performed yearly in the US. Most common age of a meniscus injury occurs in males ages 31-40 and females 12-20. Menisci are not stationary and they move. The least mobile portion is the posterior horn making it the most susceptible to injury. Seek the advice of a Physical Therapist if you injure your knee or need post -operative rehabilitation. Every year over three million people in the United States will suffer from a torn meniscus. In some cases, surgery is a must. The surgeon will determine whether to repair or trim the damaged meniscus. After surgery, Physical Therapy helps the patients to recover motion and in most cases, the proper post-operative rehabilitation will enable patients to return to their pre-injury status regardless of the surgical procedure. The knee joint has round Femoral condyles sitting on top of the flat Tibial plateau. The ends of the bones are covered with articular cartilage (Hyaline cartilage) and the edges of the plateau are covered with the meniscus. The meniscus’ role is to help stabilize the joint and dissipate the forces that occur when the condyles articulate upon the plateau by adding surface area for the condyles to move upon. 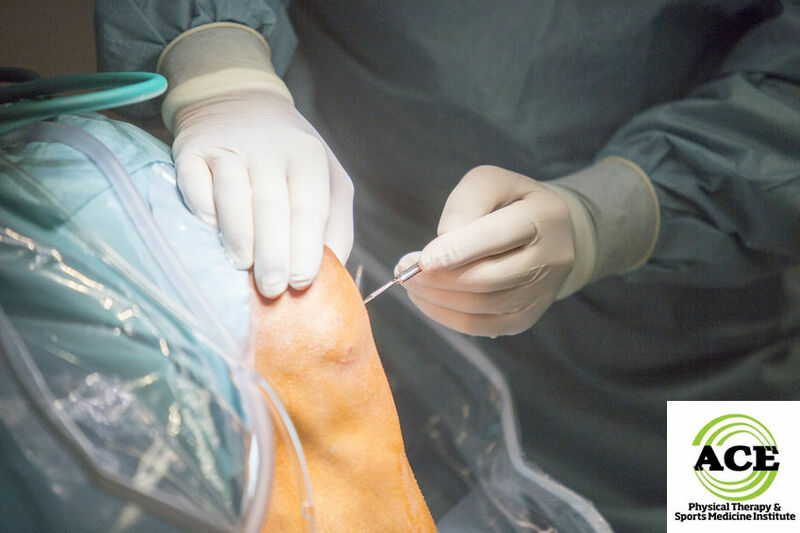 While the knee joint is capable of performing all kinds movements and activities, it is also highly susceptible to injuries due to its anatomical make up. If there is too much compressive or sheer force acting upon a portion of the meniscus, the fibrocartilage is not able to sustain its continuity and it tears. In most cases, the torn meniscus causes the joint to be swollen, painful and unstable. It might limit the joints motion and reduce the person’s ability to perform functional activities. It almost always forces the person to seek medical help. The doctor will assess the condition of the knee with a physical examination and most likely a MRI. Once the diagnosis is determined the course of treatment usually involves surgery to “fix” the problem. If the damaged meniscus is not surgically “fixed” the joint becomes more likely to develop arthritis in the future. During the surgical procedure, the surgeon determines whether to repair or remove the torn piece. If there is an adequate blood flow to the torn area of the meniscus, the surgeon will opt to place sutures in the tear and “hold” it together until the body heals the torn area. If there is not an adequate blood flow to the tear, the torn piece will be removed. The meniscus does not “grow back” therefore the surgeon will remove as little as possible to help preserve the function of the meniscus. In either situation, Physical Therapy rehabilitation will commence within one week of the surgery. The Physical Therapy rehabilitation following the surgery differs if the meniscus is repaired compared to a partial removal (meniscectomy). If the meniscus is repaired, the patient will be required to be non-weight bearing for a period of time (usually 2-6 weeks). The patient might have motion limitations for the same amount of time, but there will be no restrictions to strength development. If a portion is removed, there are very few restrictions to the rehabilitation process. The first phase of Physical Therapy rehabilitation will consist of exercises, activities, the use of manual techniques and modalities to control the pain and swelling. The joint will be moved to assure that the range of motion is not lost. The exercise routine will incorporate core, hip and knee stretching and strengthening exercises and activities. The Physical Therapist will design a program with total consideration of the weight bearing status. If the meniscus is repaired, the patient is instructed to be non-weight bearing for several weeks. During this time, the muscle structure in the involved lower extremity will atrophy (dis-use atrophy). The second phase of Physical Therapy rehabilitation will take place when the patient is able to transition to full weight bearing status and their range of motion, swelling and pain are controlled. Exercises will help the muscle structure recover from disuse. The exercise routine will be “ramped” up to include a variety of “closed chain” or “foot on the ground” exercises. The primary goal of phase two is to have the patient return to pre-injury status and lifestyle. Meniscus injuries occur in every age group and are one of the most common knee injuries that Physical Therapists deal with on a daily basis. The decision to repair or remove a portion of the damaged meniscus is up to the surgeon. In most cases, the proper post-operative rehabilitation will enable the patient to return to their pre-injury status regardless of the surgical procedure.